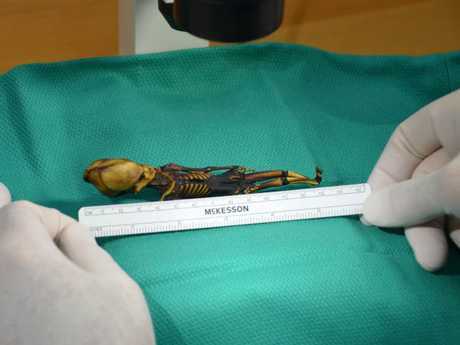 A TINY 15 centimetre skeleton thought to be that of an alien has long baffled scientists - but now its mysterious origins have been uncovered. The unusual looking mummy left scientists scratching their heads for years, as they studied its cone-shaped skull and noted it only had ten ribs. But after claims it must have belonged to an alien creature, DNA tests have shown it is in fact human. It is the remains of a little girl who had dwarfism - the skeleton was found in 2003 in Atacama, Chile, and was nicknamed "Ata". It was discovered in a leather pouch in an old abandoned church, before a Spanish collector got hold of the remains. They began to speculate it was an alien life form, due the unusual appearance of its bones. Finally, after five years of careful analysis, scientists have worked out why the skeleton had several mutations. Tests at Stanford University, San Francisco and the University of California found the baby died 40 years ago. She had several genetic conditions which stunted her growth, linked to dwarfism and other bone disorders. The skeleton is thought to be that of a premature baby, or one who died just after birth. Garry Nolan, a professor of microbiology and immunology at Stanford University School of Medicine, believes the research on Ata may one day benefit patients. She could hold some clues to help people with bone growth problems, or people who have bad breaks. He started looking into her case in 2012 when a friend said he might have found an alien. Speaking to The Guardian, he said: "She was so badly malformed as to be unable to feed. In her condition, she would have ended up in the neonatal ICU, but given where the specimen was found, such things were simply not available." "While this started as a story about aliens, and went international, it's really a story of a human tragedy. "A woman had a malformed baby, it was preserved in a manner and then 'hocked' or sold as a strange artefact. It turns out to be human, with a fascinating genetic story from which we might learn something important to help others. May she rest in peace." But despite the tests giving answers to several of the questions that swirled around Ata, her unusual skull still remains a mystery. It has been suggested in the past it may have been caused by a condition known as oxcephaly - which causes a premature closure of the sutures that separate different bones in the cranium. This article originally appeared on The Sun and was republished here with permission.